Osprey feasting on a mullet from the Atlantic coastal estuaries at Merritt Island National Wildlife Refuge, Titusville, Florida. 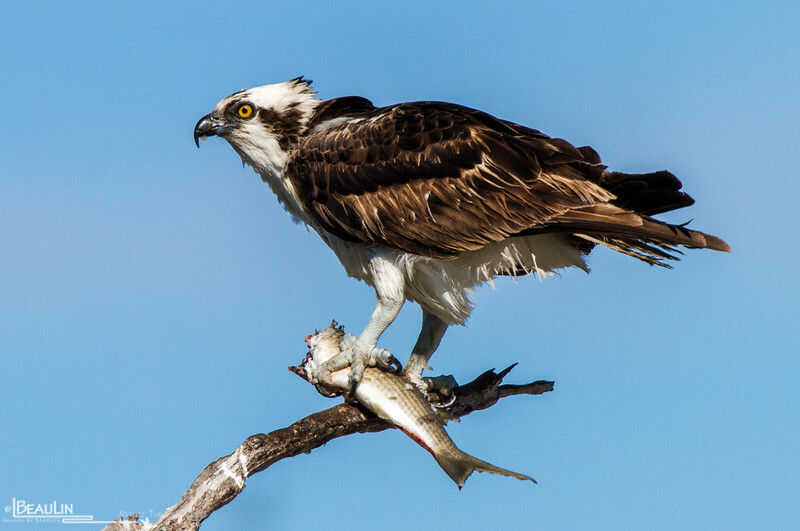 Among the best studied of North America’s raptors, the Osprey, also known as the sea hawk, fish eagle, or fish hawk, is the continent’s only bird of prey that eats almost exclusively live fish. Ospreys have colonized a broad array of habitats, and all but southernmost populations are migratory. An Osprey nesting in central Canada and wintering in southern Brazil might fly more than 1.2 million miles in migration during its 15-to 20-year lifetime. Ospreys dive feet first for their prey, accessing only about the top few feet of water. Historically nesting only in trees, they have readily taken to artificial nesting sites such as power poles and nesting platforms. North American Ospreys gained increased recognition during the 1950s–1970s because many populations crashed as a result of exposure to high levels of contaminants (especially DDT and its derivatives) that caused severe eggshell thinning, and high reproductive failure. Research on osprey provided key evidence in court to discontinue use of certain persistent pesticides, and thereafter populations recovered rapidly.